“It may be famous for the pristine holiday beaches of its Indian Ocean coastline but the Maldives has taken a dark authoritarian turn. In 2008, the island nation became a democracy after Mohamed Nasheed was sworn in as president after the country’s first-ever free and fair elections,” writes Amal Clooney in the Guardian. “A charismatic leader, Nasheed introduced liberalising reforms at home, while calling for global action against climate change in an attempt to combat the rising sea levels that threaten to inundate the low-lying nation. His remarkable story is chronicled in the acclaimed documentary The Island President. “Seven years later, however, Nasheed is in prison, having been sentenced to 13 years imprisonment for the crime of “terrorism” following a politically motivated show trial. Police Superintendent Abdulla Nawaz has defended the import of of over US$100,000 (MVR1.5million) worth of crowd control equipment from the UK’s Survitec Group. The shipment of items – including various types of tear gas grenades and ‘rubber projectiles’ – was revealed by the UK’s Guardian newspaper yesterday. “It’s not that the police are going to use each and every shell that has been brought to Maldives. The intention is very clear, it’s not that we intend to use it every time people come out onto the streets,” Nawaz told Minivan News today. The Guardian quoted the UK Government as saying that it had would have blocked any such exports from within the country. “We have not issued any licences for the export or trade of crowd control equipment to the Maldives in at least the last year. Under current circumstances, we would not do so,” the Department for Business, Innovation and Skills told the Guardian. The items evaded such scrutiny as they were shipped from Brazil after being sold by a Singapore based subsidiary of the company. 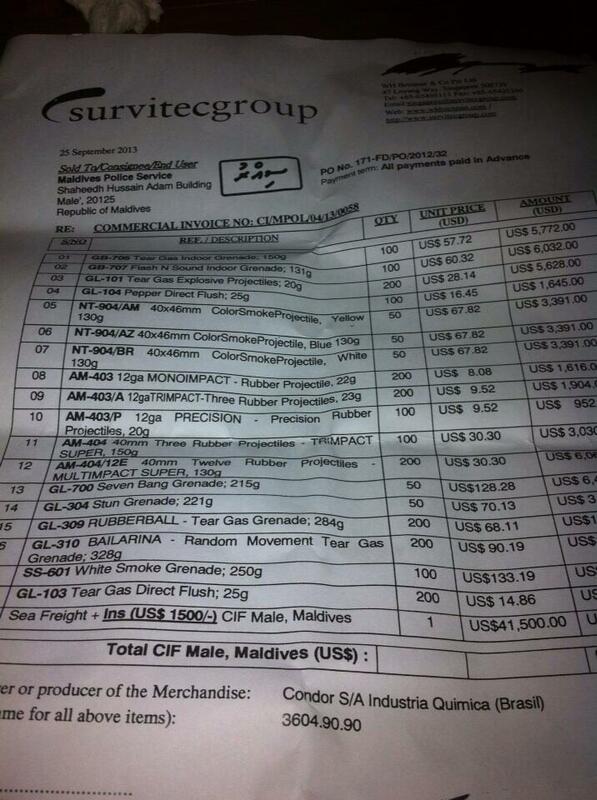 The itinerary – shipped at a further cost of US$40,000 – has been leaked via social media, and includes tear gas and tear gas grenades costing US$46,632 (MVR718,132). When asked if the police had been able to procure such equipment from other countries, or on other occasions since the controversial transfer of power last year, Nawaz said that he did not know and would need to gain further clarification. The Guardian’s article quoted both Amnesty International and Friends of Maldives as being used for political repression, particularly following the police’s integral role in the delay of the rescheduled elections on October 19. “It’s tempting to think this consignment looks like a case of pre-emptive stockpiling by the MPS, forewarning a possible crackdown if the elections process continues in a manner not to its liking,” Friends of Maldives’ Dave Hardingham told the Guardian. Nawaz today argued that the equipment listed was perfectly ordinary for any police force to have, urging that people instead focus on the way in which the equipment was used. “Even though there is tear gas, we should look into how police have reacted. I believe that during the past 18-19 months, the force actually used against protests was very minimum. Very rare occasions,” he said. Nawaz said that the police would do everything it could to look into any cases of excessive force by police, and urged independent authorities such as the Police Integrity Commission (PIC) and the Human Rights Commission to do the same. The police played a key role in the contested resignation of former President Mohamed Nasheed on February 7 2012. Anti-government protests led by then-opposition political parties and religious scholars resulted in a mutiny by a segments of both police and military officers against Nasheed, resulting in his premature departure from office. The following day, Nasheed along with the MDP and thousands of people, took to the streets in protest claiming that he had been ousted in a bloodless coup d’état. The demonstration were soon met, however, with a brutal crackdown from both police and military officers during which MDP MPs and members of the public sustained injuries. The Commonwealth backed inquiry into the events of February 7, although claiming that the day’s events had not amounted to a coup, urged reform of the police force. During a parliamentary inquiry by the Parliament’s Executive Oversight Committee (EOC) twelve months on, the PIC claimed that actions by police were unlawful and amounted to crimes worthy of prosecution by the state. After concluding its investigations last June, President of the PIC Abdulla Waheed said the commission had investigated a total of 20 cases of police misconduct that took place on February 6,7 and 8. Out of the 20 cases, 12 concerned police brutality during the crackdown on protests and during the events that unfolded, while eight concerned issuance of unlawful orders, obeying unlawful orders and officers failing to comply with the law while on duty, said Waheed. I have just become aware of the Guardian article ‘Maldives police accused of civil rights abuses being trained by Scottish police’ and feel obliged to make comment since I am mentioned in it but wasn’t consulted for a view on the matter. I spent some time in the Maldives as an independent Police Consultant having been invited by the then Commissioner Adam Zahir to conduct a root and branch review of the Maldives Police Service practices and procedures in the capital Male’. My 2006 report made a total of 76 recommendations for improvement, 95 percent of which were later approved by the Force Executive. I also spent some time assisting with the implementation of many of these recommendations and was quite confident that real progress was made in developing the service being provided to the public by what was, in effect, a fledgling police force in a developing country. I was not alone in providing this type of assistance and worked alongside officers from the Australian Police and members of the Scottish Police College and was in fact personally instrumental in introducing the College Training input to them. My presence in the Maldives was generated by a desire by both the police hierarchy and the government of the day who, to their credit, recognised the need for developmental training for their police staff to devise, implement and improve the delivery of a sound community-based policing model. I was very impressed by the enthusiasm and cooperation I received at all levels to achieve this end. Quite clearly, radical change in any organisation takes time to establish itself and I was under no naive illusions when I left the country at the end of my contract that it wouldn’t take a while for the changes to become thoroughly embedded in the policing culture. I was content however that they were on track to become a much more efficient and effective law enforcement agency. The somewhat unforeseen political developments which have taken place in the Maldives since I left are not my concern nor of my making. I spent my professional life in a policing environment which was completely divorced from political interference in operational matters, which is exactly the way it should be everywhere. That said, any breaches of human rights which have taken place in the country and attributed to law enforcement officers are a real concern to everyone and can only serve to hinder the progress the Maldives makes into becoming a modern democratic state. Misconduct by police officers in any of the ways alleged is highly troubling and needs to be vigorously dealt with and stamped out by the organisation. Notwithstanding, it is of considerable concern to me that Severin Carrell’s article in the Guardian seeks to establish a connection between my training input and that of the Scottish Police College and others to the alleged “thuggish” and “brutal” conduct of a minority of police officers in Male’, the inference being that the Scottish Police connection has been wholly inadequate or that I/we actually trained them or somehow influenced them to behave in that way, a thought process that is almost too ludicrous to contemplate. The Scottish Police College can speak for themselves but it is quite obvious to me that elements of the opposition parties and others with axes to grind in the Maldives are mischief making in taking advantage of the current situation and have manipulated the platform of the Guardian newspaper to attack the integrity of the police, whom they see as an arm of the current government, and that the Guardian took the bait hook, line and sinker, producing an article which is so one-sided and biased that it barely merits the column inches it inhabits. The tack it takes however also by implication taints me personally and it is not in my nature to let that pass unchallenged. The quotes cherry-picked from my 2006 report about the force’s Special Operations Command and used in the Guardian article – an “openly paramilitary organisation” and a “macho elite … most of whom lack basic police training” – were some of many comments intended as constructive criticism of different facets of the force and which formed the basis for structured improvements. Notably the Guardian fails to mention that as a result of these comments the SOC subsequently underwent considerable developmental training in an effort to correct the issues I highlighted. It is well known in the Maldives and worth commenting on that opposition political parties pay gangs of youths to infiltrate so-called ‘peaceful demonstrations’ and thereby generate violent confrontations with the police to discredit them, but I also note no mention is made by Severin Carrell about that either. Recent events in the streets of the UK involving some of the worst rioting in living memory serve to highlight that even in so-called developed democracies situations arise where policing is tested to the utmost and mistakes are made in dealing with them. While I abhor the abuse of power by any law enforcement agency it is easy with the benefit of hindsight for people who weren’t there to sit in a cosy armchair and criticise actions taken or not taken by officers at such highly charged scenarios where in reality the use of pepper sprays and batons can often be both justified and legal. Quite a long period of my police career involved working in a complaints and discipline role and I am the first to advocate harsh treatment of serving police officers who break the rules of their office, especially when it involves blatant criminal behaviour, but it is a different matter altogether when fingers are randomly pointed and uncorroborated accusations are made in the thinly disguised name of a political cause and spread across a UK national newspaper in furtherance of that. Since working in the Maldives I have an affiliation with the country and its people and the work I did there was genuinely focused on helping to make it a better place to live and work. The fact that things now seem to be unraveling to an extent saddens me a great deal but it is disingenuous in the extreme for anyone to pursue their personal objectives by inferring wholly innocent individuals are somehow to blame for it all. I would suggest that, as well as apologising to me, if the Guardian wants to get involved in such matters as the Maldives crisis it takes a less naive and more balanced approach and looks much more searchingly at everything going on there, as well as giving more credit for the positive things that have been achieved by dedicated people. Impugning the professional integrity of those striving to do good things may be the Guardian’s idea of a good story but I doubt if many right thinking people would agree. A final word – the present Commissioner of the Maldives Police Service, Abdulla Riyaz, is a well respected, dedicated and fair minded individual of the highest integrity who has devoted his professional career to the improvement of policing services in his country. I have worked closely with him in the past before he was appointed to his current position and I hold him in high regard. He is well able to defend his own position and actions but I feel it is grossly unfair for his considerable achievements to be undermined in the way this Guardian article has done. Scottish Police Superintendent (retired), John Robertson, was an independent police consultant to the Maldives Police Service in 2006 and 2008. Senior UK government figures including Foreign Secretary William Hague are to be quizzed by politicians over the role of a Scottish police college in training Maldivian officers accused of perpetrating human rights abuses in the country. Following an investigation carried out by UK-based newspaper The Guardian, politicians at Westminster and the Scottish Parliament of Holyrood are to press government ministers on the Scottish Police College’s role in training Maldivian officers. The Guardian has reported that the MPS stands accused of using “torture and sexual assault against detainees and acting against democracy activists and journalists” after the controversial transfer of power that occurred on February 7 this year. Police authorities in the Maldives have played down the abuse allegations raised by a number of NGOs such as Amnesty International, questioning possible bias in the data gathered in their reports. The MPS has also said that the allegations of abuse did not reflect the international scope of training provided to officers in the country. The UK-based newspaper’s investigation reported that at least 77 senior Maldives police officers and commanders – including the Commissioner of Police Abdulla Riyaz – had been trained by the Scottish Police College, located in Fife. Amnesty International, former senior Maldives officials and opposition activists said they had deep concerns about the UK’s links with the MPS after officers were accused of breaching human rights, the Guardian reported. The Scottish Police College, which is reportedly earning significant sums of money through working with MPS officers, has an ongoing contract to train Maldives police officers on a diploma course for junior ranks and middle and senior rank officers. Speaking to the Guardian, the MPS said that it took its obligations seriously, and that reforms recommended by British advisers, as well as consultants from Canada and Australia, were being implemented by the MPS. Commissioner of Police Abdulla Riyaz was not responding to calls from Minivan News at the time of press. Police Spokesman Hassan Haneef told Minivan News today that there was no link between the training local police officers received in Scotland and the allegations of abuses carried out by some of its officers. “Our training is in accordance to regulation supplied from other countries all over the world, including the UK, Canada and Australia,” said Haneef. The UK Foreign Office has meanwhile defended the UK’s record in the Maldives, but spoke of concern over the surge in violence since the ousting of Nasheed in February. “We have serious concerns about allegations of police brutality in Maldives, especially in February 2012,” a Foreign Office spokeswoman told the Guardian. “We have privately and publicly urged the Maldivian government to fully investigate all allegations and ensure perpetrators are brought to justice. We have also called on all parties to ensure institutional reforms are put in place to consolidate democracy and further protect human rights in Maldives. Farah Faizal, the former Maldives high commissioner to the UK, told the Guardian that close links between British police and the MPS had to be urgently reviewed. In November a three-man delegation from the Inter-Parliamentary Union (IPU) expressed concern over the failure to punish the police officers who used “excessive force” against MPs earlier this year. Philippine Senator Francis Pangilinan from IPU’s Committee on Human Rights of Parliamentarians, speaking to members of the press, revealed: “The delegation is deeply concerned that the police officers who used excessive force against the members of parliament earlier this year have not yet been punished, and that Members of Parliament appear to remain subject to intimidation. “The delegation points out that in several of the cases in the use of excessive police force, there is clear video evidence available which should have enabled the authorities to take effective and swift action. The delegation therefore calls on authorities to do everything possible to expedite their efforts to a successful conclusion,” Pangilinan said. A Spokesperson from Scottish Police College at Fife told Minivan News that it would not be reviewing its training procedures, but would be taking guidance from the High Commission on whether its existing agreement with the MPS would continue. “We are continuing conversations with the High Commission on the matter,” the spokesperson said. “The Maldives stand on a knife edge. At stake is its hard-won liberal democracy, forged from the ruins of a brutal, 30-year dictatorship – a period that was synonymous with serious human rights abuses, including extra-judicial killings and torture,” writes former President Mohamed Nasheed for the Guardian newspaper. “President Maumoon Abdul Gayoom’s rule was eventually ended in 2008, by a democratic vote in which I was elected. But it is important that the outside world clearly understands that Gayoom, his allies and his henchmen are back. It was they who established, late last year, the ‘December coalition’ of Islamic extremists who accused my government of being controlled by ‘Jews’ and ‘Christians’ and used incitement to religious hatred and violence as political tools. It was they who orchestrated February’s overthrow of the Maldives’ first democratically elected government. And it is they who control the current administration as well as the police and armed forces. From this position of strength, they are slowly squeezing the life out of the democratic fabric of my country. Despite this, the Commonwealth Ministerial Action Group (CMAG), which met last week, is considering removing the Maldives situation from its agenda. A decision is expected in late September later this month. The choice before the group, comprising the foreign ministers of Australia, Bangladesh, Canada, Jamaica, Sierra Leone, Tanzania, Trinidad and Tobago and Vanuatu, could hardly be more important. Thousands of pro-democracy protesters in the Maldives have been brutalised by the police, arrested and imprisoned. Many of them have been tortured, or charged with terrorism – the favoured means, post 9/11, for repressive states to dispose of opponents. Journalists have been beaten and arrested and media outlets threatened with legal action and closure. Freedom of speech is being strictly curtailed – people can now be arrested for calling members of the current government ‘traitors’. And the country’s independent oversight bodies are being staffed with friends and relatives. Leaked cables from the US Embassy in Colombo have revealed American diplomatic concerns alleging Sri Lankan President Mahinda Rajapaksa and former army commander Sarath Fonseka were last year responsible for war crimes committed during the end of the civil war against Tamil separatists. The US diplomatic cables, leaked by whistle-blowing website Wikileaks, includes 3325 from Colombo, making the Embassy in Sri Lanka among those hardest-hit by the scandal. In a leaked cable sent on January 15 2010, Ambassador Patricia Butenis remarked there was a clear “lack of attention to accountability” following the mass killings of Tamils in the final days of the war, a situation she described as “regrettable” but unsurprising. “There are no examples we know of a regime undertaking wholesale investigations of its own troops or senior officials for war crimes while that regime or government remained in power,” Butenis said in the cable. In a comment piece published in Minivan News on November 30, Butenis condemned the release of the cables and said it was important for diplomats to be able to have “frank” discussions with their colleagues and counterparts. “We support and are willing to have genuine debates about pressing questions of public policy. But releasing documents carelessly and without regard for the consequences is not the way to start such a debate,” she said. The US has stated that it will not comment on the specific content of the leaked cables. “A disclosure like this is bad for contacts, harmful to global engagement and makes it difficult to tackle problems such as organised crime and nuclear proliferation,” he said. The Sri Lankan President was due to meet the UK’s Defence Secretary on December 3, as well as address the Oxford Union, however the visit was cancelled for security reasons. The Maldivian government, which this year won a seat on the UN Human Rights Council, recently established a credit line to Sri Lanka worth US$200 million. The announcement was made by President Mohamed Nasheed on November 18 prior to departing for Sri Lanka to attend the swearing-in ceremony of the Sri Lankan President. “Thousands of couples across Europe and the US who have married or renewed vows in Asian ceremonies must now be wondering what was really said as rings were passed and kisses were exchanged,” writes William Sutcliffe in the UK’s Guardian newspaper. “However pleasant the officiators may have seemed, however sincere the tone of the ceremony appeared, it is clear now that literally anything could have been passed off as a blessing or a chant. Of course, this should always have been clear, but such is the determination to believe in some vague ideal of Eastern mysticism that most people who buy into these ceremonies presumably dismiss any legitimate scepticism as somehow “Western” and inappropriate.